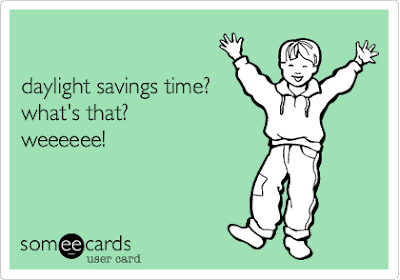 Usually I dread the ending of Daylight Saving Time for a month in advance. All that "extra hour of sleep" nonsense doesn't apply to parents — everyone knows it means we'll be up feeding our kids breakfast at 5 A.M.
You can't even laugh at this, can you? But this year my kids were so tired, both from staying up late swimming through their trick-or-treat candy like Scrooge McDuck in his vault of coins the night before AND staying up late for a family party the night before that, they actually slept in an hour and a half past the time they usually do on Sunday morning. If I were the kind of person who ever said the words "awesome sauce," I'd probably say them right here. Did you know that there's a learning curve to trick-or-treating? It took my toddler an hour to get that when you go to someone's door and they lower their bowl full of candy to you, you're not supposed to take one out of your own bucket and give it to them. Although the world would probably be a nicer place if we did have a holiday where we randomly ring people's doorbells and give them stuff. We're gearing up for winter and making sure that everyone has the requisite $1 million worth of coats, hats, gloves, mittens, and boots — without actually spending a million dollars per child. This always gets a little interesting. Especially when you find a thrift store where the clothes hanging off the racks are just high enough for your one-year-old to run screeching underneath at top speed through the entire building. Usually my toddler's physical therapist from Early Intervention comes over when the older kids are at school, but this week we had a teacher development day and they were home during our appointment. I sent them upstairs to clean their room, hoping things wouldn't get too chaotic. It was going pretty well until one of them appeared and announced loudly, "Mom! There's dirty underwear under the bed and I don't know whose it is and I am NOT touching it!" Up until that point, I think I'd fooled the therapist into thinking we were pretty normal. In sad news, our pet crayfish Flippy died this week. She lived a good, long crayfish life. I mean, really long. My daughter brought her home from school 3 years ago, and I was thinking she'd only live for a year or so. We were beginning to think this thing was immortal. Nothing sadder than an empty tank. RIP, Flippy. Honestly, I hate it when pets die. Not because I get attached or because the kids undergo mental suffering, but because someone (read: me) has to dispose of the body which is the grossest, creepiest job on my resume as a mom. Dead animal bodies give me the heebie jeebies and if it were up to me, I'd just dump it in the trash while dry heaving, but since it's their pet I have to be sensitive to the bereaved. We have to scoop it out and put in in a box and bury it, when really, I want nothing more than to just fling its stiff carcass into the woods behind our house and let nature take its course. On a related note: if Phillip and I ever decide to start a business together, it should probably not be a funeral home. Speaking of pets, if you're interested in a feral flying squirrel, just let me know in the comments. You can have one for free if you can come over to our basement and convince it to enter the trap instead of somehow just eating the peanut butter bait and running away. Really sorry to hear about Flippy, you must have cared for her (confirmed?) very well. The Halloween/time change combo really went well here too! My kids are still getting out of bed and going to sleep at a more appropriate time a week later. I did nearly pass out on the table when our insurance salesman came last night though. We got the peace and quiet with kids in bed we were going for, but I kept yawning every time he spoke! Oh no, condolences on the loss of FLippy. My thoughts are with the family at this sad time. Giving your candy away- ha! My kid had a similar trick or treat learning curve. His problem was that he was confused about going to someone's door and NOT going in the house. At age 2 or 3, that completely baffled him. Any time we had gone to someone's house before, we would ring the bell and go in, so this new behavior was completely puzzling to him. About every third house he would slip past me and dart into the people's houses to start petting their dog, or playing on their piano - fortunately, people thought it was funny, but I was pretty embarrassed. Maybe if he were 6 or 7 that wouldn't have been as funny, but I bet people thought it was adorable. You're right, that must have seemed so weird to him that you weren't going inside!